Hey there inky friends! I'm back with a fun little project I created for a Sunday Brunch event coming up. This cute little recipe card holder will accompany my casserole so that my yummy recipe can be shared with others. 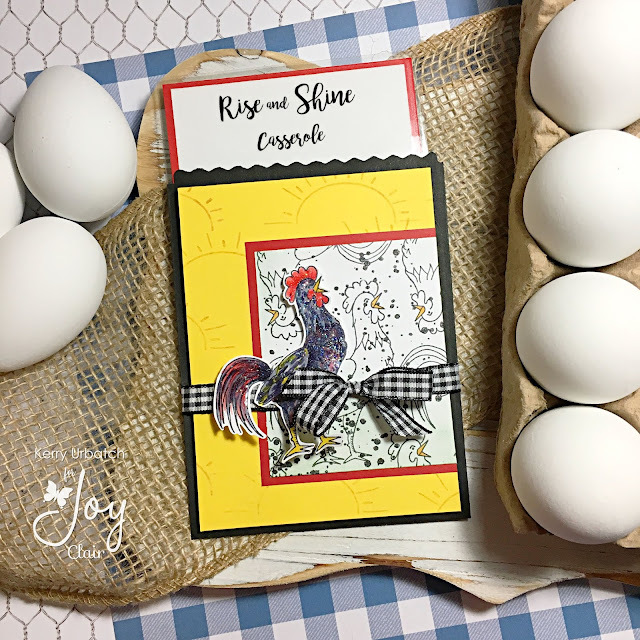 This project features the new Rise And Shine stamp set from Joy Clair. 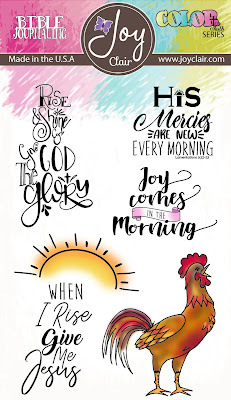 I created the recipe card by typing and printing the recipe/directions on my printer and then stamped the sentiment and sun with Distress Oxide ink. I then mounted these panels onto red cardstock and then ran the whole card through my laminator machine (I have a cheap Scotch laminator that I purchased at Wal-Mart). After laminating, I cut the card down so that it could slide right into the recipe pouch. I stamped the little rooster onto white cardstock using Memento Tuxedo black ink and then colored with a variety of Copic markers. After coloring, I added some Glossy Accents and microfine glitter to make him shine. Next, I stamped the rooster again onto white cardstock and then colored his beak yellow. I flicked some black metallic ink onto this panel before attaching to a red base. 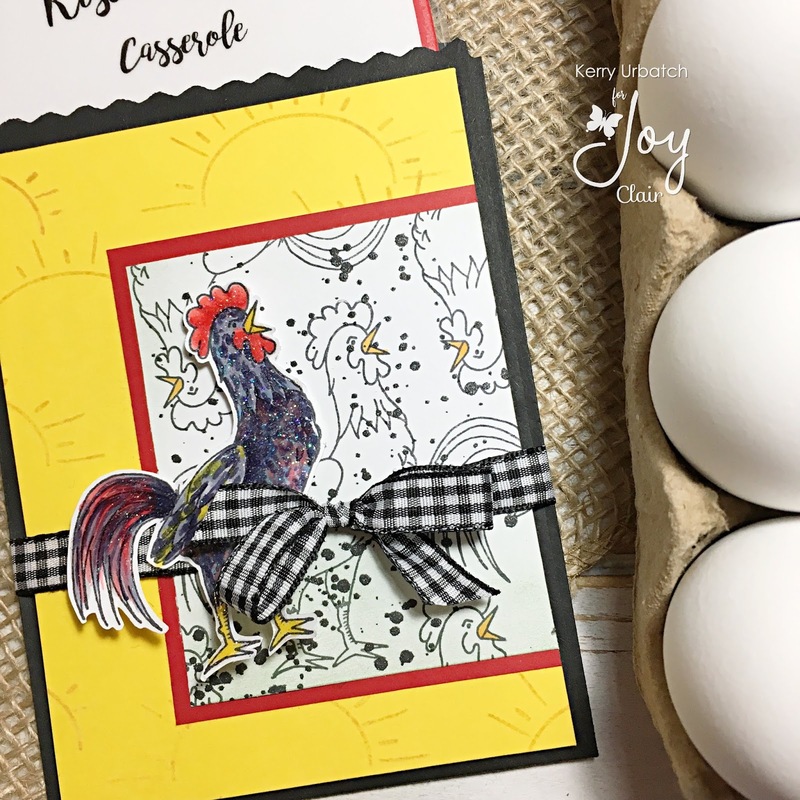 After that, I stamped the sunshine onto a piece of yellow cardstock using Distress Oxide ink and then attached the red rooster panel onto it then onto the black treat bag (these Jillibean Soup black bags were purchased at Tuesday Morning for a steal!) Some black grossgrain ribbon was tied around the bag and the colored rooster was tucked in with foam squares. To finish everything off, I slid the laminated recipe card into the bag! I sure hope you enjoyed this project. If you happen to give my recipe a try, please hop back over and let me know what you think. I'd love to hear your thoughts!